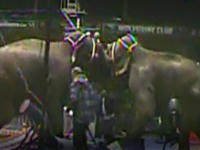 An ADI investigator working undercover inside Jordan Circus World filmed as two out of control elephants began to fight as circus workers desperately tried to stop them in Orem, Utah. Trainer Habib Omar and another elephant groom beat the elephants with bullhooks but Isa the elephant charges into an elephant, believed to be called Bunny, easily driving the over two ton elephant backwards. Other ADI footage of the elephants performing in Utah, New Mexico, Texas and Oklahoma, shows them being controlled with blows and jabs and electric shocks from a stun gun. Presenter Habib omar is seen slipping a stun gun from his pocket during performances. The elephants continue to be used for rides. ADI sent formal complaints to the occupational Safety and Health Administration (OSHA) and the United States Department of Agriculture (USDA).